A plethora of books dealing with the north-east rainforests have hit the markets recently and I thought it might be of interest to some of our international readers to learn about them. 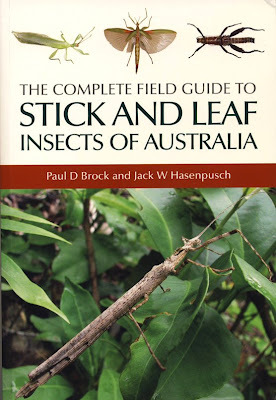 Stick insects (Walking sticks in the US & Canada) are a prominent component of the Australian Insect fauna. Some 150 species have been described and it is expected that around 200 will be the total once the fauna is better known. But why stick insects? Well they are very prominent members of the insect community. They range in size from some species that are only a few centimetres long to others that are well over 12 cm in length. They are popular pets, especially in the UK & Europe where they have popularised by the Phasmid Study Group, a club with members of all ages and from all professions that have been hooked by the appeal of keeping and breeding these insects. A number of Australian sticks have made it to the hobbyists overseas. The most popular is Macleay's Spectre, Extatosoma tiaratum, a spectacular species well illustrated and discussed in the book. The book is a guide to identification and is written in a popular style that will appeal to anyone who wants to know more about these insects. There are chapters on rearing and keeping these insects as well as how to photograph them. 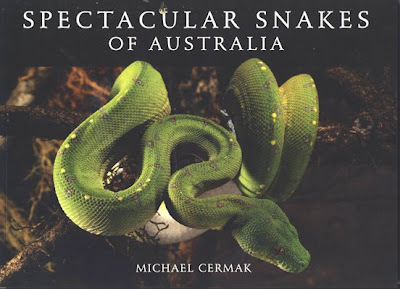 Michael Cermak is an excellent photographer and if you are interested in snakes, this book is a must. Published by CSIRO Publishing, it is a wonderful photographic essay of Australian snakes, their behaviour and habits. Many Australian snakes are fearsome and dangerous. To the credit of the author, this fact is not overemphasized. The beauty and place of these snakes in their environment, their strategies for survival and hopes for the future make interesting reading. Many visotors come from overseas to see the Great Barrier Reef off Cairns, in northern Queensland, but only a minute percentage of them get into the Cape York peninsula much beyond Cooktown. Reasons for this are simple. Beyond Cooktown there are few paved roads and the main roads are off-limits during the rainy season. So special effort need be made to visit this remote part of Australia. 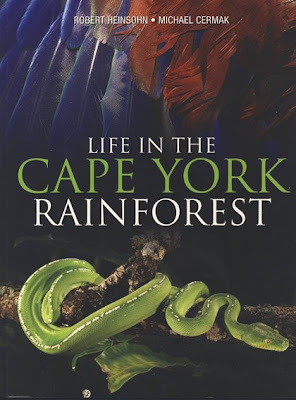 This book will probably do a lot to encourage folk to make the extra effort to visit Cape York. The writing of Robert Heinsohn and the photographs of Michael Cermak combine to produce a splendid book that should be of interst to Australians and foreign visitors alike. 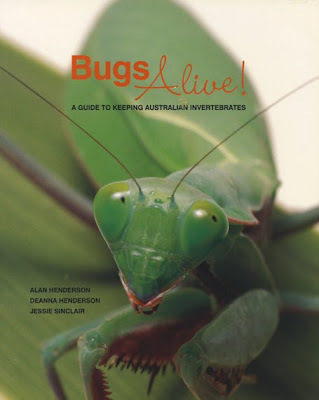 Anyone fascinated by nature will want this book published by CSIRO Publishing. 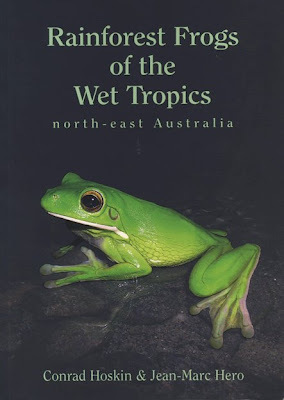 For people living in the northern wet tropics of Australia, this book is a must. We probably have around 15-20 species of frog in the Kuranda area and to have a book dedicated to the identification of these amphibians is most helpful. There is a key, excellent photographs and copious notes on ecology and behaviour. This book was published a year or so ago but it is most worthwhile to note it here because it may not be generally seen on the overseas market. Published by the Museum of Victoria, the book is a must for any individual, museum or zoo that wants to keep and cultivate invertebrates. The authors are in charge of the Museum's live exhibits and have successfully kept everything from ants to water beetles. They have set out the care guides in an easy to understand way with plenty of photos and drawings. You'll learn about special temperature, humidity, foods and lighting requirements of each species they deal with. They have chapters on how to make an attractive terrarium and how to display your captive creatures. This is a quality book of international standards and will captivate not only to those who want to observe invertebrates alive, but to the general public as well. Meet Litoria caerulea (White), the Green Tree Frog. 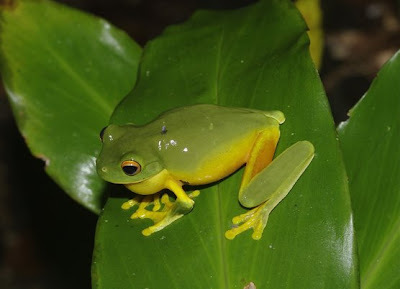 (Listen to the call of this frog at the website).This is one of the most commonly encountered frogs that a visitor is likely to meet. Many introductions to this species are fraught with anxiety because of the odd habits of this frog. Nearly every outback public toilet has these creatures living within. That’s not so unusual but to have them living in the toilet cistern is a bit off-putting to the uninitiated visitor to say the least. The frogs crouch under the toilet seat or under the rim of the toilet bowl, often in considerable numbers. If it was a small frog, one might overlook the experience. But this is a large frog, often getting to 100 mm in length. They are persistent and won’t budge. So when the perplexed human uses the toilet the next worry is "What if it jumps up while I’m in the middle of.....". And then "What happens if I flush"? Well the frogs usually stay put and don’t jump while you are in the midst of... And when you flush, they just swim around the bowl and almost never go down the drain. And if they do, they seem to crawl back and assume their perching under the rim. They will be there the next time you need to use the toilet--if you ever need to again! In some public toilets I have seen multiple species in this role. It’s great for a frog. They have fresh water-eventually and the toilets are usually lit at night providing a great source of snacks. But this poor frog was photographed near our garage. Normally these frogs are grass green but this one is sick. It is off-colour. Note the “wound” between the right fore leg and the right hind leg. This is probably the exit site of a fly parasite, Batrachomyia sp. 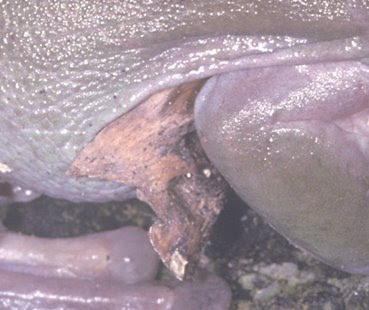 There are many species in this genus that parasitise a number of Australian frogs. The little fly on top of the Orange-eyed Frog below is one of these flies. They are members of a fairly large and diverse family, the Chloropidae. In other parts of the world they are usually detritus feeders but a parasitic habit has evolved in Australia. This just adds to the problems that Australian frogs are undergoing at present. It would be of interest to report that the flies parasitise the introduced Cane Toad, Bufo marinus, but this seems not to be the case. Stony-creek Frogs are actually a complex of closely related species separated from L. lesueuri that differ genetically from one another, (Hoskin & Hero, 2008). They are not that easy to distinguish in the field. L. jungguy and L. wilcox are the ones easily confused in the Kuranda area. L. jungguy is more often found in rainforests so it seems likely that this is the one illustrated here. 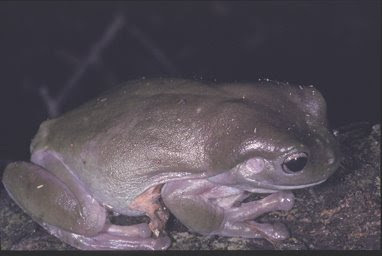 The Northern Stony-creek Frog is fairly common on the ground on wet nights. It is frequently seen around the lights where it captures small insects. It can be fairly large- 39-71 mm but this is a small individual. These frogs sit motionless on the ground for long periods. All you can observe moving is the sides of the thorax as the frog breathes. I’ve always thought they are sitting ducks for hungry Cane Toads, Bufo marinus, that are in the same habitat, only more numerous. Although the Stony-creek frogs are excellent jumpers, attaining more than 1 metre with a single hop, once the Cane Toad has grasped one, there is little chance for escape. The Northern Stony-Creek Frog lays hundreds of eggs along the shores of rainforest streams between August and May. Hoskin, C., Hero, J.-M. 2008. Rainforest Frogs of the Wet Tropics North-east Australia. Griffith University. Gold Coast, Australia. Pp. 1-89. The recent deluge has brought havoc to the human community but there are some that find it a delight. With each downpour it seems a different frog species is activated into breeding behaviour. Meet the Orange-eyed Treefrog, Litoria xanthomera, length about 50 mm. This little frog shows up after heavy rains at this time of year and forms rather noisy choruses along ditches well away from streams at night. Listen to the call of this frog. But look carefully. You'll see a tiny fly parasite biting the frog as it vocalises in the rain. 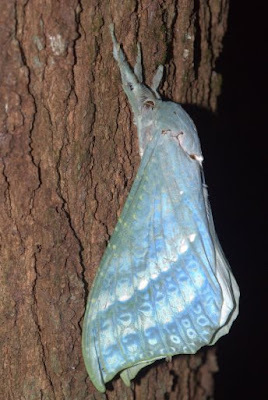 Ghost Moths (family Hepialidae) receive their name from the habits of at least one European species in which the male hovers above the ground at twilight rising and falling to attract females. At times several males form a lek and exhibit this peculiar behaviour. The term has been applied to all species. “Swift Moths” is another term for the family which is probably more appropriate. I recall evenings spent with the late Don Mac Neill at his home in El Cerrito, Cal. at twilight trying to get a glimpse of “Ghost Moths” flying low over his fern collection and very easily evading his ever-ready net. 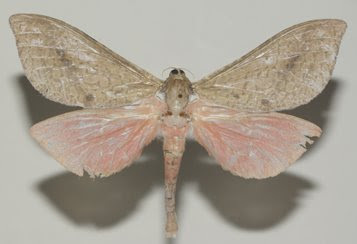 In Australia we have over 100 species of Ghost Moth ranging in size to some small species of Fraus and Oncopera. As an aside, the biology of many species was studied extensive and in great detail by Norman B. Tindale in a series of publications dating from 1932-64. One of the incredible observations he made was his estimation of the number of eggs produced by females another hepialid species, Trictena atripalpis (Walker). He estimated a female laid some 29,100 eggs and when he dissected her later, an additional 15,000 eggs were counted. Tindale also studied orthopteroids (crickets and their relatives). His treatise on the biology of mole crickets is a classic. Norman was a dynamic person. I met him by chance at the California Academy of Sciences in the 60’s. He had moved from Australia and was living in Palo Alto. He visited the Academy of discuss moths with Don MacNeill from time to time. Later in Canberra at a meeting of the Australasian Sound Recordings Association (ASRA) I played a recording of my Oligodectoides tindalei and a friend from the Australian Institute of Aboriginal and Torres Strait Islander Studies (AIATSIS) made a comment about “another” Norman Tindale who was a big a big-time archaeologist. Turns out it was the same person. He’s equally claimed by the archaeological community and with some justification. He was active in the early 1920’s excavating and challenging orthodoxy. His cinematic and audio recording of aboriginal activities in the 30’s is truly classic. Take some time to read these notes. Back to the Ghost Moths. 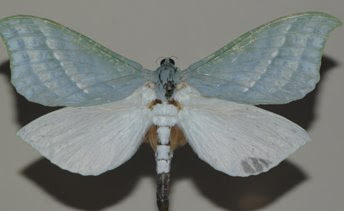 Aenetus mirabilis (Roths.) is one of the beaut moths that comes to light on rare occasions. Some 10 species in this genus occur between Cooktown and Paluma, Qld. This species spends the larval stages boring in Ash, Alphitonia. 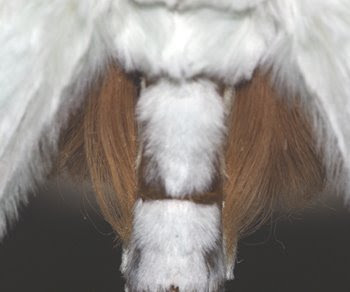 Males have odd scent glands that are associated with tufts of hairs (scales?) that produce a powerful floral scent. My colleagues can smell it, but, unfortunately, it is lost on me. A. tegulatus Pagenstecher is a more widespread species. It is known from Indonesia south to New Guinea. I found it at my light at Bawley Point, N. S. W. as well as at Kuranda. I know nothing of its habits. Same male spread. Note the "scent hairs" at the base of the wings. Same male. "Scent hairs" magnified. A related species A. tegulatus. To give you an idea of the size of these moths, this moth measures 125 mm across.